A dusty old attic full of mysterious antiquities is the setting for Mythic Maiden, a 5 reel, 20 payline video slot from Net Entertainment. Treasures lurking amongst the clutter include lots of free spins and triple payouts whenever a wild forms part of a winning combination. Go hunting from between 30p and £150 per spin. 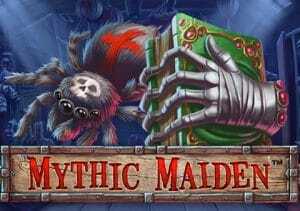 The visuals in Mythic Maiden have a ghoulish feel. The antiques hidden in this attic aren’t the things you’d see in Bargain Hunt – they’re a much creepier collection. The lower value playing cards are shaped out of candle wax. They’re joined by chests, spiders, books of spells, skulls and death masks. Landing 5 of the latter will see you pocket 2,000 coins. The moon/skull window is the game’s wild – as well as replacing all other symbols apart from the scatter, it also trebles the payout every time if makes up part of a winning combination. Landing 3 or more of the circle of light scatter on the same spin triggers the Free Spins feature – 3 of them will get you 10 free spins. 4 award 15 free spins with 30 on offer if you’re lucky enough to find 5 scatters. Keep a special eye on the iron maiden casket on the right hand side of the reels which is opened for the feature – it can magically boost each free spin with a multiplier that can reach up to 10x. Alternatively, the iron maiden can add up to 2 more free spins to your tally. Well-designed as usual from NetEnt, the creepy cartoon visuals are tidily done. The soundtrack has a certain ghoulish charm too which certainly enhances the horror-theme. The variance in Mythic Maiden is somewhere in the medium range with a balance of payouts offered. The wild wins are a welcome addition to the base game (and the free spins for that matter) but it’s the iron maiden which is the key to finding a big haul of treasure. Get those multipliers flowing during the feature and the Mythic Maiden can conjure up some very real treasure – with up to 3,220 times your stake on offer! If you like the ghoulish theme, Microgaming’s Electric Diva is a superb game to play.